For this third part, I would like to talk about a case study that was taken from a Bazi (a form of Chinese astrology) book written by a Hong Kong master. 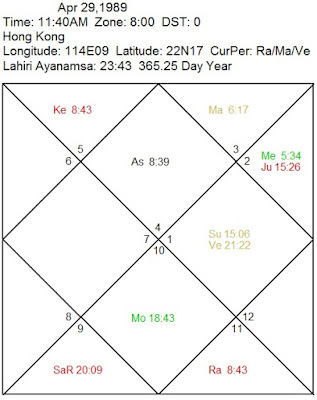 The case is rare as most Bazi books do not show the actual birth timing but instead show only the eight characters derived from the birth time. Jupiter, Saturn, Rahu and Ketu are the functional malefics in this chart. Moon is the main determinant for health in this chart. Although it is well placed in the 7th House, Moon is severely afflicted by Jupiter. Jupiter being the 6th Lord is the secondary determinant for health and it is weak itself. The reason being its mooltrikona sign is directly afflicted by Ketu. Based on these observations alone, we know for sure anyone born at this timing will suffer poor health for life. Moon is also a significator for mental health and it is severely afflicted as mentioned before. The determinant for intellect is Venus which is in 10th House and combusted by the Sun. 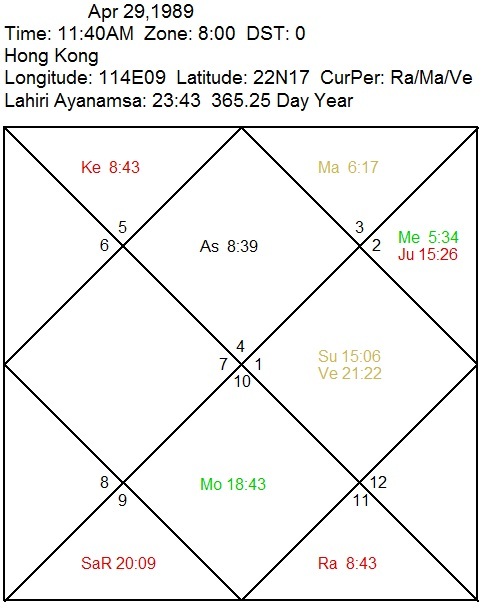 The 4th House for intellect is also afflicted by Ketu by 1 degree. Only Mercury (the other significator of mental health) is safe and well placed in the 11th House. The direct affliction by Ketu residing in the 2nd House also brings problems related to the mouth or speech. The Reality: The boy (now a man since he will be 28 years old this year) was born a mute with low IQ. If only the birth timing was calculated beforehand and adjusted accordingly, the health implications would have been potentially prevented.